The most important and influential Osaka artist of the late eighteenth century. An innovator whose style may well have influenced such artists as Shunei and Sharaku. 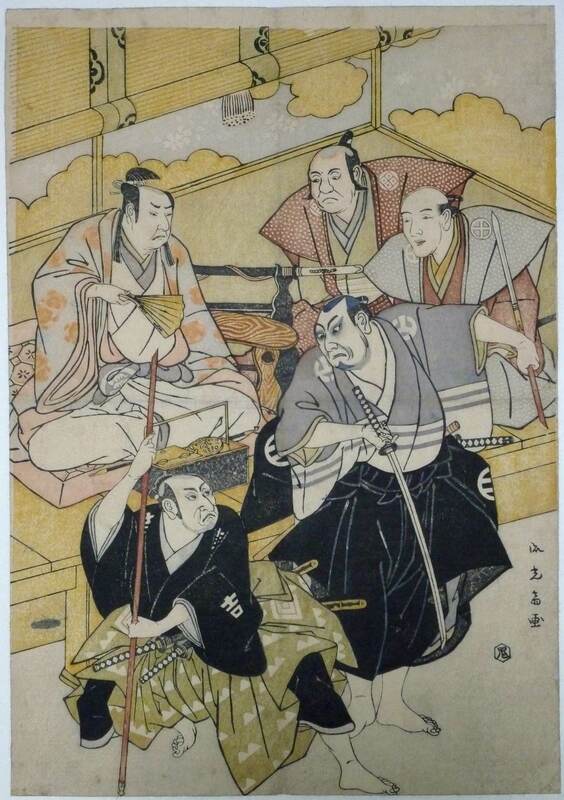 His prints – mostly hosoban – are all of the utmost rarity. Indeed, it is thought they originally formed triptychs but, so far, no complete design has been located. The oban design offered here is even rarer, there being only two other impressions known: Illustrated in colour, pl. 13, in Kamigata Ukiyo-e Nihyaku-nen Ten, “200 Years of Kamigata Ukiyo-e,” Susumu Matsudaira, 1975; and pl. 43, p. 56, catalogue of exhibition Ukiyo-e of the Kamigata Area at the Osaka Museum of History and Yamaguchi Prefectural Hagi Uragami Museum, Kitagawa Hiroko, 2014. Shows five actors. From right to left (rear): Nakamura Kyojuro, Arashi Sangoro III, Kataoka Nizaemon VII and (front): Asao Tamejiro I, Ichikawa Danzo IV. Published c 1790 by Ki. Fine impression. Very good colour. Small areas of contemporary hand colouring to face and costume of Tamejiro. Slight folds and small sumi mark bottom left, otherwise very good condition. Probably full size. Signed Ryukosai ga.